Men's fashion blazers with the entertainer in mind is just what you're going to get with the After Midnight label sewn inside. After Midnight specializes in men's fashion blazers that Entertainers love to be seen wearing when they are performing on stage and need to be seen. 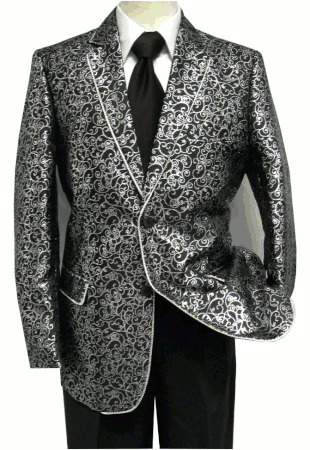 This black and silver fashion blazer features a modern fit and has silver piping and a woven swirl pattern design with side vents in back.